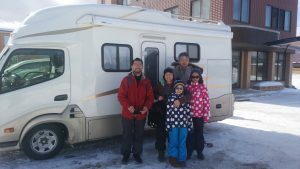 Q How was the trip in Hokkaido with Camper van ? Would you recommend your friends? Very cold at night. Yes,I would. Q How was our service? Are you satisfied? Great. Yes,we can rent ETCcard and HEP,and have and pad for us to use. Q Are there any service we are not providing that you would like to see us provide? Some options are free on the website,but it’s not true. Copyright (C) 2015 レンタキャン北海道. All Rights Reserved.